id Software mastermind John Carmack is rewriting part of the Doom 3 in order to avoid some potential legal headaches when it's released as open source. 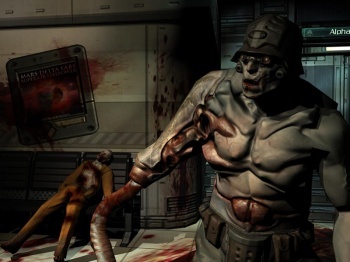 At QuakeCon 2011 in August, John Carmack announced that the source code for Doom 3 would be released to the general public as open source sometime following the release of Rage. But even though Rage came out in early October, there's still no sign of the Doom 3 source. What's the holdup? It could be partly due to the fact that Carmack is rewriting some of the source to avoid potential legal hassles with Creative Labs. A stencil shadowing technique called "Carmack's Reverse," jointly created by Carmack and other coders, was used under license in Doom 3, but Bethesda lawyers - you know how they are - raised the possibility that releasing the source code with that technique included could cause trouble. And instead of doing what a normal person would and calling the whole thing off as legally unfeasible, Carmack elected to simply replace the offending bits with new code. "Lawyers are still skittish about the patent issue around 'Carmack's reverse', so I am going to write some new code for the doom3 release," he tweeted. Say what you will about id's recent catalog but you have to admit, that's a pretty damned cool thing to do - not that it was an especially onerous task, as it turned out. "This demonstrates the idiocy of the patent," he wrote in a follow-up tweet. "The workaround added four lines of code and changed two." He did not, however, indicate when the Doom 3 source will be released.